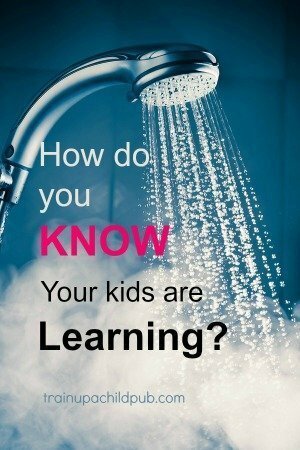 How do you Know Your Kids are Learning? Elbow deep in soapy water, I felt a light tap on the top of my head. Peering at the ceiling, I spied another drop on its way down, seemingly originating from the can light over my kitchen sink. I wonder what the kids are up to? I took the stairs two at a time. At the top I heard muffled squeals of delight. Hot steamy clouds hit me as I opened the bathroom door. On full blast, the shower pummeled two fully dressed kids sitting on a bath towel submerged in the tub. With. water. overflowing. everywhere. “We’re in the rainforest!” shouted my daughter happily. “Yeah! We’re floating on a raft down the Amazon River!” my son yelled, barely audible over the pounding of the shower. Like any self-respecting mom, I was winding up to let ‘em have it. That is when the lightning bolt hit. MY KIDS WERE ACTUALLY LEARNING! And this “dramatization” was proof! Charlotte Mason’s approach to learning using living books, instead of textbooks, really works! We’d read a few fascinating books about the rainforest. They’d done oral narrations over what they’d read. They’d completed copy work about the rainforest. They’d drawn pictures of the rainforest (another form of narration). And now they were dramatizing a scene in a story they were creating, with themselves as the stars! Our recent readings about the rainforest had ignited their imaginations! Isn’t that what Charlotte Mason homeschooling was all about? Presenting children with a “feast of ideas” and letting them ‘form their own relationships’? My kids weren’t playing in the shower, they were ‘at home in the climes’ of the South American jungle! So…. are your kids learning? How do you know? P.S. If your answer to the question above was “I don’t know,” you might take a hard look at the curriculum you are using. Is it boring, or is it inspiring? You can perk up any curriculum by reading more great literature. Here’s what it can do. I can’t agree with you more about Charlotte Mason learning! I’m glad it brought back some memories for you, Beth! What a beautiful mess!!! I love those moments where most think, ” omg, look at this mess! !”, but God gives me grace to see how beautiful a mess it is and to know my children are enjoying themselves…. The Charlotte Mason approach not only allows your children to learn in a relevant and interesting way, but it also makes for some precious homeschool memories. Thanks for sharing, Dana! It sparked some memories from our own homeschool. Hi Lindsey! Isn’t it amazing how much your son has learned on his own about something he is passionate about? I love that homeschooling allows children to develop and pursue their own interests! Good for you for allowing him time for that! My son loves metal detecting-It’s not what I wrote in my lesson plans for this year, but he has researched and read about this hobby all year long. He has learned so much history, geography, science, and done so much reading and writing, all on his own, on the subject. He can tell me so much about it. Not once has it been in my “lesson plans,” and yet he is practically an expert!